30 | August | 2007 | ZOMG, Candy! 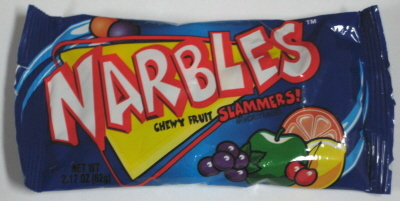 I found these Narbles at the grocery store in the candy display near what used to be the video rental area. I had never heard of Narbles, but the bag was super cheap so I decided to give them a try. 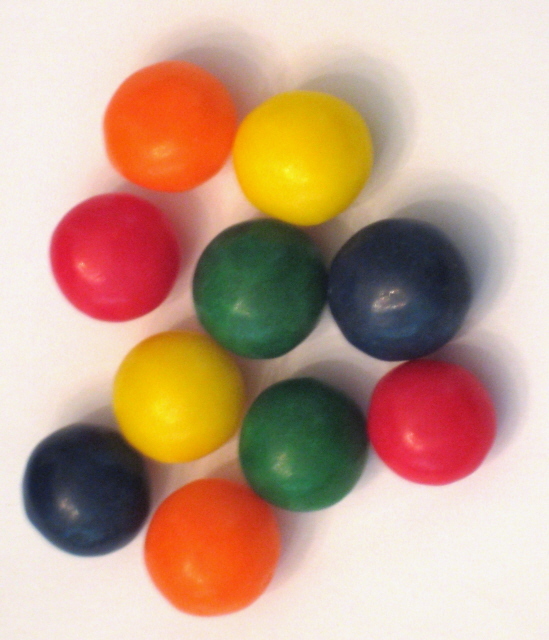 Narbles are like spherical jelly beans – the good kind of jelly bean, like the kind made by Starburst (BUY) where the flavor is strong and vibrant. 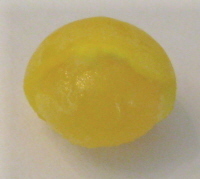 Narble shells, however, are much thicker than those of jelly beans, and I found it a hair too thick to make chewing easy. The chewy jelly insides also dissolve easily, unlike jelly beans, which can sometimes get stuck in your teeth. The flavors are cherry (generically artificial cherry taste), grape (a strong artificial grape lollipop/popsicle flavor), orange (a strong sweetness that could have used more of a citrus tang), lemon (way too sweet and barely any lemon taste), and apple (also way too sweet and with hardly any discernible green apple taste). The cherry ones are actually red, by the way; for some reason they showed up pink in the photo. Narbles are pleasant enough. They’re intensely sugary, so they’re not terribly addictive. If Starburst jelly beans didn’t exist in the world, I’d gladly eat these instead.